There are very few songs that hold the distinction of being considered “timeless.” To achieve honor, a song should be one that has withstood the test of time, lasting decades or more, be well known by most people and be recorded by a wide variety of artists within several genres. Two songs that have earned the right to be called timeless is “I’ll Fly Away” and “I Saw The Light.” One group recently covered these songs in an impressive manner worth admiration. The Daves Highway Group, made up of siblings Delany (22), Zachary (21), and Erika (19), are from Brandon, Missouri. These three amazingly talented siblings taught themselves to play their individual instruments and sing. The group was formed in 2007 and have since traveled all over the United States in an effort to share their music with others. The trio recently performed in Texas and opened up their set with “I’ll Fly Away” in breathtakingly sweet harmonies. The group encouraged the crowd to sing along with them, then moved into their next song, “I Saw The Light,” which of course also includes beautiful harmonies. The ability of these siblings to effortlessly blend their voices is almost breathtaking and you simply have to hear it yourself to comprehend their talent. Suffice it to say, you will understand why a Texas audience was stunned to silence. “I’ll Fly Away”: Written by American composer Albert E. Brumley in 1929, “I’ll Fly Away” is a timeless classic that has been vastly popular throughout history. 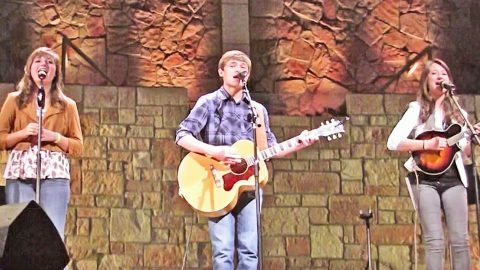 Though originally written as a gospel song, it has been recorded by artists in all genres. “I Saw The Light”: This song started out as a country song, originally recorded by Hank Williams, before becoming more of a gospel standard. It has since been covered numerous times. The Daves Highway group definitely knows how to pick them when it comes to songs. Of course, their ability to perfect the harmonies within the melodies is closer to angelic than earthly. Listen for yourself to see if you agree.